Fasting allows the body to have a good ‘house-cleaning’ and a rest. It is a way to health and long life. 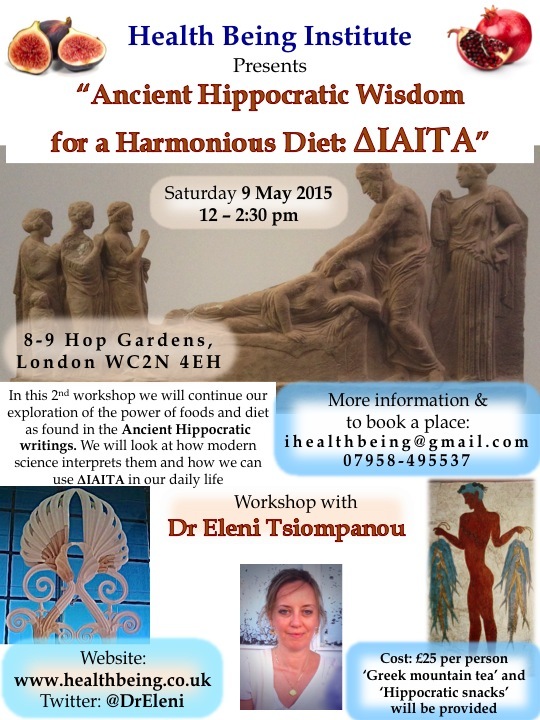 We are coming together again on the 9th of May to continue our exploration of the ‘Power of Foods’, what Ancient Hippocratic Philosophy can teach us and how we can aspire to a Harmonious Diet, which is called “ΔΙΑΙΤΑ”. If you are in London, then come and join us. Cost: £25 per person. Limited availability. 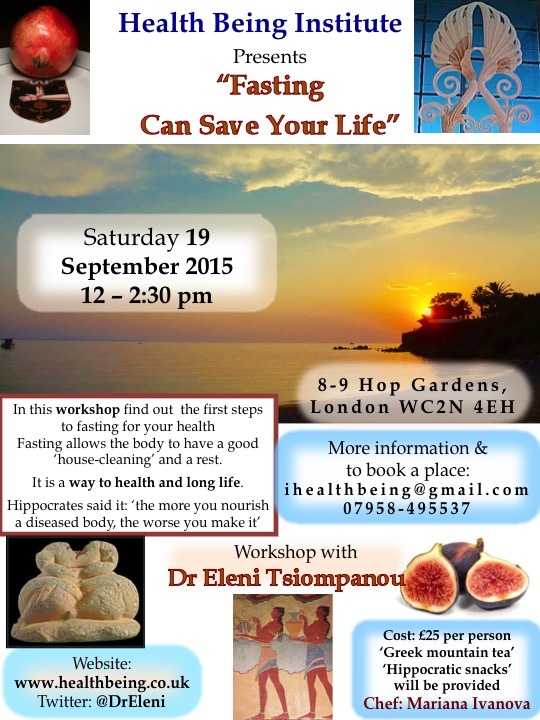 ‘Greek mountain tea’ and ‘Hippocratic snacks’ will be provided. Learn how to choose foods, combine & cook them, to use their power for your own health. Listen to Ancient Recipes with their History and Nutrition Secrets. This workshop will concentrate on Ancient Greek Foods, popular in modern day life, such as figs, pomegranates, greens, herbs, millet, barley, fish, dairy etc. These two quotes taken from the Hippocratic books were written 2,500 years ago. We will examine them under the lens of modern science and medicine. We will continue to explore the power of foods in future workshops. 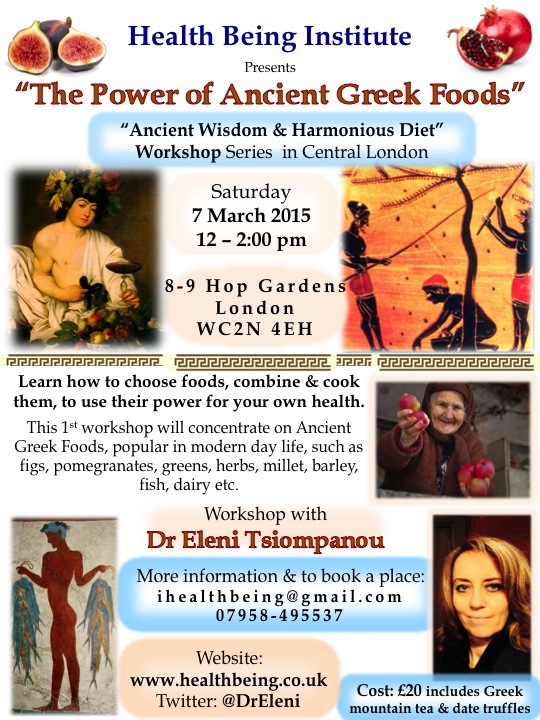 To find out more come to our 3rd “Ancient Wisdom & Harmonious Diet” workshop with Dr Eleni. So you think you are eating well? Did you know that ‘time, person & place’ matter for diet & health? 2,500 years ago, Hippocrates taught how dietary needs change with age, season of the year, personal characteristics and the place one lives. Now modern science has revealed more. 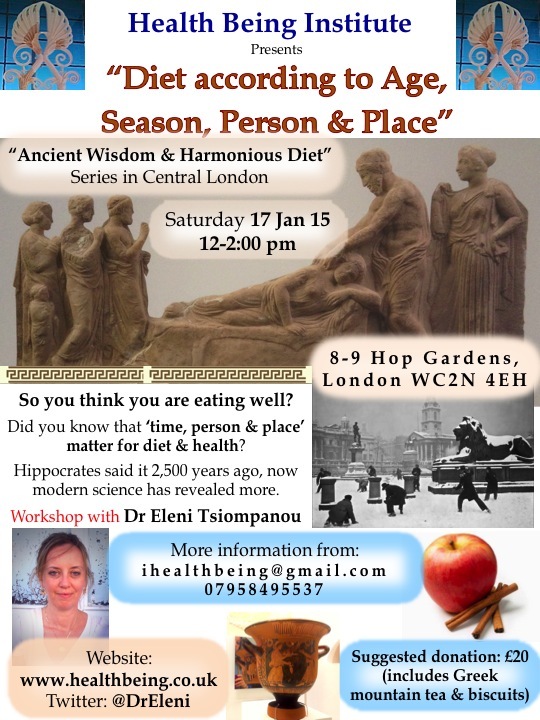 To find out more about the importance of individualised diet, come to our 2nd “Ancient Wisdom & Harmonious Diet” workshop with Dr Eleni.